The webinar takes place on Thursday, July 12 from 1:30 to 3:00 p.m. EST. 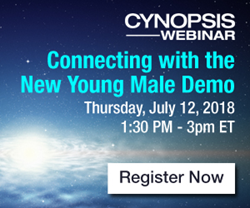 Cynopsis will host the July 12 webinar, Connecting with the New Young Male Demo, to share proven strategies for connecting with and engaging this elusive, but highly desirable, group of influencers. Lynn Leahey, Editorial Director for Cynopsis, will lead the discussion with speakers Maggie Fosdick, VP of Client Success for Engagement Labs, Ed Romaine, Chief Brand Officer for Bleacher Report, and Eric Svenson, VP of Marketing for Newsy.